near Kuravilangad in the beginning of the second century. Many believe that it happened in the beginning of 2th century AD. The traditional dating of the foundation of the Church is 105 AD. The miraculous intervention of St. Mary in the construction of the church is evident. It is belived that first appearce of Mother Mary happened at Kuravilangad. The never drying well on the hill top is an evident testimony. It is also said that the Jewish tradition of conducting prayer at hill top and the Jewish Persian tradition of building church at hilltop are the reasons behind construction at hill top. The present Marth Mariam Church has been built in 1960 by Manakatt Thoma Kathanar. The Church was renewed three times in the past before 1960. The Old Mani Malika has an inscription which tells the date of construction as AD 337. The Madbha is in Portuguese style. Thora has many murals. 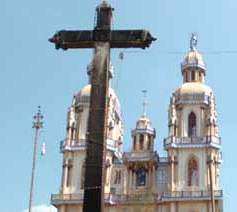 The present south Sankirthi is the Madbha of the Church which was re constructed in 1550 AD. The North Sankirthi was built on 1580 AD. 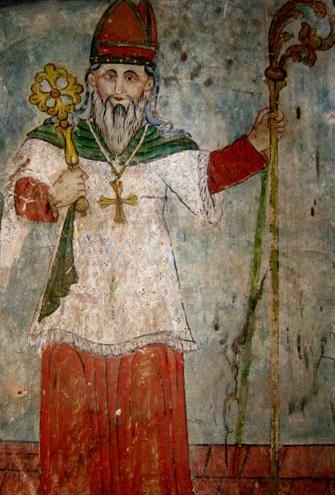 There are many old murals, icon in the Church. There is also a Vadhya pura attached to the Church. The Open air cross is of 34” feet height and was installed on 1575 AD . There are 124 lamps in the open air cross. The Cheriya palli is dedicated to Saint Sebastian. It was established in 1868. The Cemetery Church was established in 1690. The Priests house was built on 1901 by Nidhiry Mani Kathanar. There are three bells which were brought from Germany in 1911 which weigh 1829 Kg,1317 Kg ,866 Kg respectively. One of them is more than 6 feet height. There is another bell which was brought from Portugal with an inscription. There is also an old bell with Syriac inscription. This bell is reported to have cast in 1584 with an inscription ” Ameh dalaha” ( Mother of God) for Blessed Virgin. Kuravilanagdu is famous for the three day Munnunoyambu feast which is participated by more than a lakh people. Rogation of the Ninevites, the three day feast and celebration of miraculous saving of Jonah, the prophet who was swallowed by a great fish is one of the main attraction. In the Old Testament of the Bible, Jonah is mentioned twice, first in 2 Kings 14:25 (as a prophet in the time of King Jeroboam II) and later in the Book of Jonah. He was the son of Amittai, from the Galilean village of Gath-hepher near Nazareth. God orders Jonah to prophesy to the city of Nineveh. Not wanting to, Jonah tries to avoid God’s command by going to Joppa and sailing to Tarshish. A huge storm arises and the sailors, realizing this is no ordinary storm, cast lots and learn that Jonah is to blame. Jonah admits this and states that if he is thrown overboard the storm will cease. The sailors try to get the ship to the shore but in failing feel forced to throw him overboard, at which point the sea calms. Jonah is miraculously saved by being swallowed by a large fish. In chapter two, while in the great fish, Jonah prays to God and asks forgiveness. As a result, God commands the fish to vomit Jonah out. God again orders Jonah to visit Nineveh and prophesy to its inhabitants. This time he goes there and walks through the city crying, “In forty days Nineveh shall be destroyed.” The Ninevites believe his word and appoint a public fast, ranging from the King (who puts on sackcloth and sits in ashes) to the humblest person. God has compassion and spares the city for the time being. The Kappalottam celebrations at Kuravilangadu Marth Mariam Church – moving an old ship around the church during the three day Munnunoyambu feast and the replication of biblical events of Prophet Jonah is due to the martime traditions of early Nasranis. The feast was conducted earlier for the safety of sailors from Kadappoor village. Conducting Kappalottam is still the right of people from Kadappoor village in Kuravilangadu. There is a museum in Kuravilangad with historical documents and artifcats assocaited with the Church. 6. Some people who have left there mark in history from Kuravilangadu. The Archdeacons were from Kuravilanagadu. After the Coonan Cross Oath in 1653 , with the ordination of Archdeacon Thomas as Mar Thomas I in Malanakra Syriac Orthodox Church, the role was changed from Archdeacon to Bishop. Mar Thoma I died around 1670-3 AD. The hereditary line of Bishops continued in Malankara Syriac Orthodox Church from 1653 until 1815 and all were from the Pakalomattam family of Kuravilanagdu. 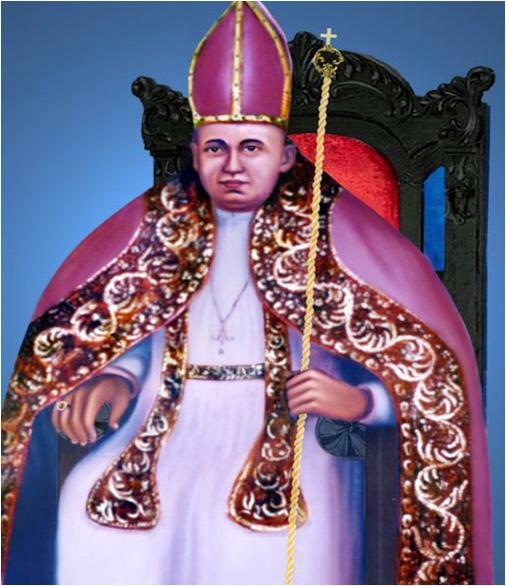 Among the Catholics, the first known indigenous Bishop of whole India, Mar Parampil Chandy is an illustrious son of Kuravilangadu. He was ordained bishop on first February 1663 by Mar Sebastany a foreign Carmelite bishop. He is also known as Bishop Alexander de Campo and was consecrated with the title of Bishop Megara in Achala. He was the Vicar Apostolic of Malabar. He styled himself as the “ Metropolitan of All India”. He has done major contribution in bringing more Churches to Catholic side after the Coonan Cross Oath of 1653. More and more Churches, Kathanars and Christians made their submission to him. He also had a clear advantage over his rival Mar Thoma I, as the validity of his Episcopal consecration was beyond doubt, while that of Archdeacon Thomas was being called into question by an increasing number of people. Mar Parampil Chandy Metran was staying at Kuravilangadu till his death, 2nd January 1687 and ruled the Catholic Saint Thomas Christians from there. After the demise of Mar Parampil Chandy (Bishop Alexander de Campo) , no indigenous Syrian bishop was appointed to succeed him for nearly three centuries in the Catholic Saint Thomas Christians who are known today as Syro Malabar Church. Rev. Fr. Emmanuel Nidhiri ( Nidhirikal Mani Kathanar ) (1842- 1904) of Kuravilangadu is a colossus in the history of the church in Kerala. He was an eminent educationalist, orator, organizer and a champion of ecumenism. He lead the community against a fearless fight against the European hegemony over the Nasrani Christians paving the way for indigenous Bishops for Syro Malabar Church. He was the first editor of the first Malayalam daily “Deepika” erstwhile “Nazrani Deepika”. Mani Kathanar played an instramental role in opening English education to the Syrian Catholics Community. As the Vicar of the Kuravilangadu church, he started the St.Mary’s English school for boys in 1894. The previous President of India, Dr. K. R. Narayanan matriculated from this school. The ecumenical association, Nazrani Jathiaikya Sangham organized by Nidhiry Mani Kathanar and Mar Dionysius, the Jacobite Syriac Church Metropolitan was one of the important happenings in Syrian Christians history.He was also the moving spirit behind the Malayalee Memorial, which was one of the first steps in the social transformation of Kerala in 1891. He has also authored a number history and other books. Please refer the following books. Pius Malekkandathil, First Edition November 2003. Mission of Sebastiani: Paul Pallath, 2006 January. 7. Punaraikya Rekhakal (Malayalam), First Edition, 1979. In 1950’s Manakkatt Thoma Kathanar (Vicar: 1951 – 60), demolished the nave and the façade and rebuilt them in the present style, without tampering the sanctuary. The period of the construction of the church and the Portuguese styled Alter given is to be modified. Archbishop Dom Menezes, laid the foundation stone of the present Church in 1599. [Reference No.1 , Page 436]. The old church was very dark and was in the old style [(1), p. 437]. The old style may be “that being built of bamboo like the temples of Gentiles” [ (1), p. 441].The new church might have been constructed using stone and mortar In 1657, when the Apostolic Delegate Sebastiani visited Kuravilangad, there were two churches: “a very beautiful church called St. Mary Major, from where we passed on to the nearby chapel of St. Sebastian, located on a small hilltop and enclosed after the manner of a fortress”. [ (2), p. 68]. There was also “a most beautiful granite cross nearby with full of oil lamps at its pedestals” [(2), p. 71.] When Sebastiani visited Kuravilangad in 1657, Fr. Alexander Parambil (De Campo) was the Vicar. After the Episcopal Consecration of Bishop Alexander Parambil in 1663, Bishop Sebastiani wrote about Fr. Alexander : “ With his own money he built two churches and a little before asked me permission to build another one”[(2), p.216]. We read that the new bishop was about fifty years old. [(6), p.12]. Assuming that Fr. Alexander took charge as Vicar at the age of Twenty-five, he was the Vicar of Kuravilangad Church from 1638 until 1663. So the construction of the two churches and the granite cross was during 1638 – 1657 and the construction of the third one during 1657 – 1663. How do you get the exact dates? Is there any other reference? Archdeacon Thomas was not from the Pakalomattom family. He was a member of the Palliveettil Parambil (De Campo) family of Kuravilangad. His mother and a brother were living at Kuravilangad. [(2), p. 71]. The mother of Archdeacon Thomas was a sister of Archdeacon George of the Cross [(4), p. 64]. Archdeacon Thomas was known as Archdeacon Thomas Parambil [(4), p. 60] or Palliveettil Thoma Kathanar [(7), p. 26]. Somewhere I read that in the case of Archdeacons, the word nephew should not be misunderstood as sister’s son and that it means only a successor. Does it mean that we can exclude a sister’s son from the right of succession? In the Pakalomattom family history, we read that the word nephew usually means a brother’s son. The first meaning in Malayalam for the word nephew is marumakan, which means either a son of a sister or a husband of a daughter. In the case of Archdeacons of Malabar, the succession was from uncle to nephew on either line; a brother’s son or a sister’s son. [(3), p. 242]. All Archdeacons of Malabar church were not direct members of Pakalomattom family. They were only belonging in some way to that family [(5), p.72]. I am from Kuravilangad and was searching the net to get some information on Kuravilangad during the Pre-Portuguese period. In the book ‘Lingerings of Light in a Dark Land’, the author Whitehouse mentions about a monastery at Kuravilangad, which disappeared after the arrival of the Portuguese. In the Milan rekhakal (old Malayalam), there is a reference to a Padippaanulla nilakura (seminary) at Kuravilangad. In the book ‘Trends in the Geography of Pilgrimages’, there is a reference to India’s oldest vision story, the discovery of a miraculous spring and an apparition of Virgin Mary at Kuravilangad. In the book ‘Saints, Goddesses and Kings’, the author Susan Bayley writes that Quilon, Cranganore and KURAVILINAT have a history of trade and commerce dating back over many centuries before the arrival of the first western travellers. These references give some light on Kuravilangad during the Pre-Portuguese period. Is it possible to get more information on these points? I hope you know about the 12th Century Gothic Cathedral at Chartres, near Paris. Now it is a World Heritage Site of UNESCO. This beautiful Cathedral is full of Stained Glass Windows. The name of one glass window is St. Thomas Window. This window depicts the missionary work of St. Thomas in India. Do you know anybody in Paris who can get a copy of this window? I would like to know a few things from you about Kuravilangadu church. You have mentioned that the granite cross was put up in the period 1638-57. NSC article says 1575 AD. Do you have any references for your dates? Aren’t these granite crosses found in Malabar pre Portuguese? 1 Menesis put up the cross at Kaduthuruthy. We do not know whether he replaced an old cross or not. 2.Muttuchira inscriptions talk about setting up the granite cross in AD 1528 and 1580 and also about connections to Portugal ( Muttuchira inscriptions). T K Joseph mentions that there was an oral tradition at Muttuchira that the church was built by the Portuguese. ( Kerala Society papers) Here also, we do not know whether Muttuchira inscriptions talk about replacing an old cross or not. If the Cross at Kuravilangadu was set up only in 1638-75, it could be Portuguese influence as Kuravilangadu church claims antiquity of AD 4th century. Gouvea comments about open air granite crosses in Malabar. He mentions that open air crosses are “much less” in Europe. ( Jornada of Dom Alexis De Menesis-A Portuguese account of the Sixteenth Century Malabar, Dr Pius Malekkandathil, p188) Dr Malekkandathil also provides information about a rock cross in Quilon, mentioned in AD 1503 by Giovanni de Empoli and Muttuchira cross in AD 1528. In Niranom Cronicles, there is a mention that the Christians were initially based at Cranganore, and after about 400 plus years, they moved to Angamali and built a church and market there and thus, Angamali became the base of Arch deacons and Bishops. After more than 700 years in Angamali, the four families moved to Kuravilangadu and built a church there. ( Niranom Grandhavari, about Kadamattathu kathanaars, “Niranom Grandhavari, Padhanavum samshodhanayum”, M Kurian Thomas,Sophia Books, Kottayam, 2000, p126) M Kurian Thomas argues that even though many historian say that the Kuravilangadu church was established in AD, 4th century, it could be ME 4th century – about AD 1125-1225, based on the above citation. The Niranom cronicles were written only in AD 1773 period and the information in the chronicles could be from the available oral tradition at that time or any other documents. The information found in the Niranom Cronicles can have some conflicts of interests too. Do you know of any evidences in and around the Kuravilangadu church about its establishment in AD 4th century? Many of the Churches in Malabar claims antiquity but no evidences. Champakulam church was founded in AD 427 by oral tradition, but we can find a definite history up to AD 1151 from the available archaeology around the church. Is there any similar archaeology in Kuravilangadu? I am quite curious to hear your opinions about these, as it seems that you have done some research about Kuravilangadu Church. I agree with John Mathew (in other article responses) that this Rogation of Nenevites of Kuravilangadu originated NOT in India but in the Church of the East in Persia! The year – roughly between AD 564 and 574. The Catholicos Patriarch of CoE – Joseph (followed by) Ezekiel. “The latter part of the patriarchate of Joseph, and the first of that of Ezekiel, saw a terrible outbreak of plague in all the East-a return of the same scourge as that which had devastated both the Roman and Persian Empires in 541, and of which Procopius has left us a description. Syriac writers call the sickness the “Shar’uth,”; but it was probably what we know as oriental plague, and its destructiveness was as awful as usual. Whole households died; and none dare enter the empty houses to gather the gold that lay there ownerless. The King, by payment of a huge reward, got together a company of grave-diggers, who collected the corpses in the capital, interred them, and claimed their fee. It was paid them; but all were found dead a few hours later, the pile of gold lying undivided by their side. An Introduction to the History of the Assyrian Church (or the Church of the Sassanid Persian Empire 100-640 AD) – by W A Wigram MA,DD, 1909. Wigram’s “Note” says that the present rogation must be a modification of an ancient fast and he seems to allude to the OT fast of the Ninevites without mentioning it. Now the question: why this custom, obviously a CoE legacy, is limited only to Kuravilangadu church? Kuravilangadu parish is famous for the Archdeacons. Any connection? The celebration of the three day fast was not limited to Kuravilangadu only. It was celebrated many ancient churches. It is not clear if there was a procession with a ship. The three day fast of Edappally church is also historically famous as the decision to consecrate Arch deacon Thomas was made and declared during the three day fast in 1653. I think this tradition was lost among both Puthencoor and Pazhayacoor due to the influence of different foreign churches among them. The Rogation of the Ninevites is not at all lost among the Puthenkoor Orthodox Churches! Although the Puthenkoor have lost the East Syriac Rite, in adopting the West Syriac Rite, they haven’t lost the Syriac ethos nor the Syriac celebrations and feasts and fasts, including the Rogation of the Ninevites. In fact, the Rogation fast is always strongly encouraged as a preparation for the 50 day fast of Lent. The procession with a ship, is of course, not used — that doesn’t at all seem to be what the Syriacs do in West Asia either. It must be some local thing in Kuravalingad. Note: I highly doubt the boat as used in the Kuravalingad festival is from the West Asians. In fact, it violates the actual spirit of the fast which is to remember the repentance of the Ninevites, and not (as is commonly misunderstood) the Prophet Jonah’s sea voyage nor his time in the sea creature. Like I said, the Assyrians had an affinity for the Ninevites who they felt were their ancestors. The fast thus remembers their ancestors early (pre-Christian) repentance. Is there any rock/metal inscriptions anywhere around Kuravilangadu other than the Bell inscriptions ? Mylacombu church near Thodupuzha (mother church of many ancient churches around MVPA) has a bell with such inscriptions (aramaic probably). This church is the most neglected among the old churches. Typical Highrange church from looks (no antiquity left). Kappalottam *has* to be somethign to do with some late migrations. Now I have some scientific proof, not just me but also Pakalomattom family. This is mainly DNA stuff so I will post in the DNA article. 1. Do you have pics of the Mylacombu bell inscriptions? Let’s see if they are Aramaic. 2. What scientific proof do you have to link Kappalottam with migrations? You see a boat and think migration? Perhaps, the simplest explanation here, is that there is an association between the boat and Jonah. Your DNA (or anyone else’s) doesn’t necessarily mean anything with respect to the festival. Finally, as migrants go, I don’t think any group in Kerala has any clearer memory of their migrant past than the various Kollam families that trace their origin to the 9th c immigrations of Mar Sabor, etc. And none of them have this boat festival. Those Kuravalingad families probably don’t have any recent migrant past — their family legends involves the fantasy of “Brahmin” conversion by St Thomas. But you’re still suggestion that there’s a link between the boat and migration. Perhaps wishful thinking is at play here. John, I am not saying that the boat festival is not related to the feast of Rogation of Ninevites. No doubt about it. But I see an extra link (Possible link) to this peculiar tradition there to an immigration. I am busy studying DNA stuff now. To me its all unreliable just like the Namboothiri crap. As per my latest findings One branch of the Pakalomattom (Manankalathil) are Iranian Jewish Migrants who arrived around the same time as the Pardesim or a little earlier (490 – 600 years ago.). Another branch (Chakalamannil + Palasseril) were probably brahmins( migrated 2500years ago and brahminised) or Migrated around after AD 500 or after. George Mathew shared a common ancestor with rest of the Pakalomattom sample around 1500years ago *only* – a branching. Cheruthone’s family branched off some 1100 years ago from the that parent branch. My Family Shared a Common ancestor with 54 others 1500 years back. Another branch (Amprayil) shared a common ancestor with the other branches more than 2000 years ago only. My family and Sebastian Vattamattathil’s family shared a Common ancestor roughly 1590 years ago. Sebastian Vattamattathil’s family and Thomas Kallakkullam’s family shared a common ancestor with 2 European samples 1500years ago. I see a clear *evidence* for my theory of Multiple waves of migration, based on available *scientific* interpretations of DNA evidence. NOTE that I am not an expert on this stuff, but still trying to gather as much information as possible before I put my theory on board. This is just an introduction to what I am investigating as of now. I seriously doubt the validity of this DNA stuff. (I doubt the reliability of the way we are interpretting the results). I am gathering information now and going through some of the possibilities. LMH, CMH etc.. I know that many would start stoning me from now onward for the idiocy that I demonstrates in this post, but I believe what I have found is *valid* as per the existing methods of interpreting scientific data. Unable to comment more at this time. So please wait until I finish. NOTE: I feel sorry for using Y-STR results of others in the project, but since Y-STR results fromt the DNA project are often referred in the comments, I feel myself at liberty to refer to particular results of the Syrian Christian Project participants. Aplogies for any inconvenience. I am very much interested in your study of Pakalomattom branches based on DNA stuff and i like to know more about your findings. 1. I agree there *may* have been many migrations, but you can’t deduce it from DNA results. The MRCA says nothing about migration times. Why? Because the obvious other possibility is that the migrants during the migration weren’t all from one family, but rather, like any migrant vessel (whether a ship, caravan, airplane, or flying saucer) probably consisted of an entire community, or a set of communities. Each may have shared a common patriarchal ancestor at differing points in history prior to the immigration. Consider a British Airways plane landing in London. There may be 100s of different families on the plane, some related, some related distantly, and others not related at all. Yet, they all arrived in London at the same time. So each time you find a different family with a different common ancestor, the “date” of the common ancestor does not indicate when they migrated. There’s no necessary connection. 2. The inscription on the bell is definitely NOT Aramaic nor Syriac! It’s Vattezhuttu — the old Malayalam/Tamil script. Inscriptions of this nature (Vattezhuttu) are extremely common in old Kerala Churches. John, I enjoyed your sarcasm. But you are missing the point. MRCA doesnt indicate when your ancestors migrated, but *could* indicate until when when your ancestors *did not* migrate. This is just like saying Knanaya Ancestors (if at all any of them where migrants from ME) didnt migrate till 800AD because 1. Cheras rose to power only after that. Archdeacon Thomas or Marthoma I was NOT the Bishop of the Syriac Orthodox Church or Malankara Syrian Church. 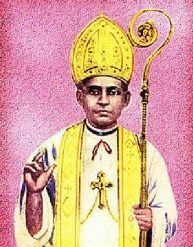 However he was the First Bishop of the undivided Malankara Church in1653. Whether that ordination was valid or invalid is a different question.Later in 1665 he chose to enter into relationship with Syriac Orthodox Church in 1665. From early historical records it is evident that the ancient church in Malabar was called Malankara Church .